Become a free-from cooking ninja with our FREE ecourse! Sign up here! Lisa shows you how to make a dairy, soy, gluten, egg and gelatine-free lemon cheesecake using coconut cream (or if it suits your diet a suitable coconut yoghurt alternative). Also, don't miss Season 4 Episode 8 where Lisa shows you a new (even creamier) dairy, soy, gluten, egg and gelatine free cheesecake filling. Hayley shows you how to make a raw vegan lemon cheesecake which is also dairy, soy, gluten, egg, gleatine and honey free using cashews. Glenys shows you how to make a totally whole food dairy-free lemon cheesecake without lemon! Her cake is also gluten, soy, egg, gelatine and hone free! She also makes a red jelly topping without berries. Anne shows you some alternatives to her baked cheesecake. Lisa shows you how to set a cheesecake without gelaine. Glenys shows you how to make a jelly without gelaine. If you loved this episode, enter your name and email below to join our newsletter list and we'll let you know when the next episode is available as well as sharing tips, recipes and all the goss about alternative cooking in our weekly newsletter. 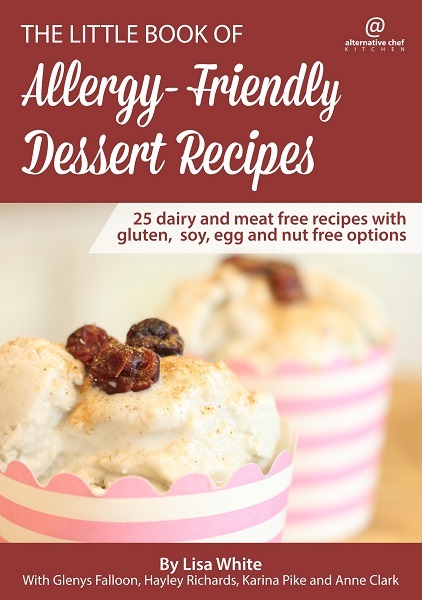 Find the recipes from this episode in ​​The Little Book of Allergy-Friendly Dessert Recipes. Looking for our FREE 8 week 'Cooking with Alternatives' ecourse? Sign up here!